On Friday, 5 September, students and faculty from Mitchell CC hosted on of the events for Davis Regional Hospital’s Amazing Race. Four-man teams competed in lots of different events throughout the afternoon. For the Mitchell event, participants traveled to four stations and had to identify various plants, skulls, and tracks. Thanks to all the students and faculty that made this possible. It was geology day as the students created their own volcanoes. 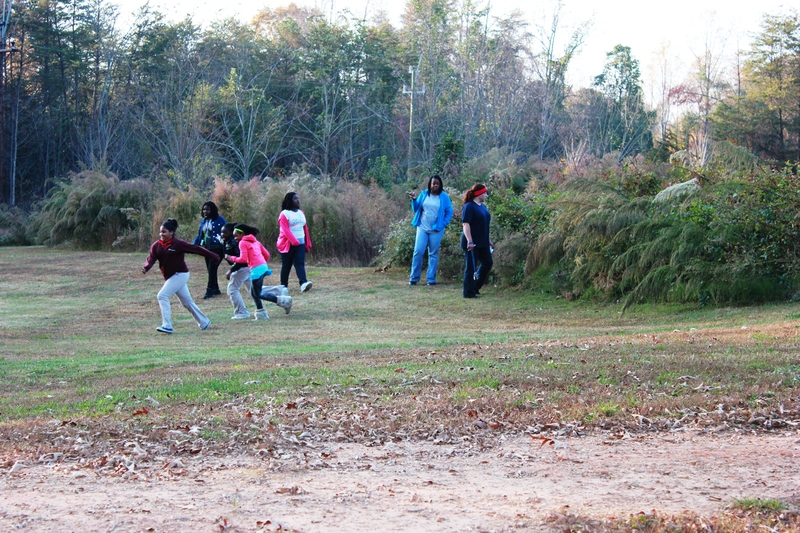 The students from the Boys and Girls club competed in two nature games. In the first game, they had 15 seconds to look at various items that were collected at the nature trail area (i.e. flowers, leaves, rocks). Then, as a group they were given 15 minutes as a group to search the area for those items. Each team had to work together as use their memory to try to remember the items they had seen. For the second game, students had to try to match various skulls and tracks with the correct picture of the organism. 5th and 6th graders spent the afternoon dissecting owl pellets. Lots of voles were found. During the past two visits, we have dissected earthworms and discussed chemical reactions. Lots of good times with great kids. Check out the pictures. 4 March 2014- Learning about owl behavior by exploring pellets. Today, we created models of cells from candy. Everyone brought some sort of candy that would represent a different organelle of a cell. We had gumballs, twizzlers, sprinkles, peach rings and other candy to set into bowls of jello. This was an exciting project for both the children and adults. We started the session by providing the students with information on a cell, such as some functions and components. After that we let the creations take shape. The students were given an illustration of a typical cell and then were asked to make a model based on that illustration. When the project was finished, the children were allowed to eat their model cells. Over the last two weeks we have collected bottles and fruit to set up pitfall traps. This week we split the students up and set them out to search for the traps in the open grass and bushes. We found out that leaving the traps over night for the bugs to crawl into yielded great results. In one we found a wood spider with lots of worms. In another trap, we found bees and ants. We had 18 bottles all together and found lots of creatures. This week, we brought 6 bird feeders and a large bag of bird seed for the students. They had fun getting bird seed everywhere while trying to fill them up! We asked them if they could name some birds that could be found in our area and they did know quite a few like cardinals, bluebirds, and robins. I asked them if they knew the NC state bird and they did. I was also informed that the NC state turtle is the box turtle. I didn’t even know there was a state turtle, so I guess the saying is true that you learn something new every day! We let them each decide where they wanted to hang their feeders so I think they had fun doing that. They thought they were funny trying to get some of us to climb trees to hang them high. We took the students outside and talked to them about owl pellets (i.e. what they are, where they are found, what is in them). We also showed them diagrams of the food pyramid for owls, explaining what they like to eat and telling the kids that they might find some of the skeletons from the owl’s lunch. We then split them into groups and supervised while they dissected the owl pellets, helping them to understand why they found what they did, and even using the diagrams to distinguish what type of prey animal they found. Though many of the kids were hesitant at first, eventually they became interested in the activity and had fun. It was enjoyable not only to watch them gain interest in what they found, but to watch them go around and talk to the other students about what they found. Many of these younger students gained an interest in science and learning, and hopefully will continue to learn more. I am looking forward to working with these children again, and helping them to understand that science can be very entertaining and exciting. We conducted 3 different events with the children. The first event was a “nature appreciation” exercise which involved the children lying on the ground, closing their eyes, and listening to the sounds of the woods for 1 minute. The individual who was able to write down the most sounds won a Hershey’s chocolate bar. We also coordinated a scavenger hunt for the children which included walking up and down the natural area searching for items listed on a hand-out. We found a number of interesting items, including owl pellets. The last exercise was done indoors and included making DNA strands out of twizzlers, tooth picks, and assorted gum drops. We installed several nest boxes, including this one for kestrels. We came up with two activities for the students. One was a relay race and the other was a predator and prey freeze tag. In the relay, two students had to individually take a CO2 card and a then an O2 card and put them in a leaf folder to simulate the process of photosynthesis. The third student in the group took a flashlight and flashed the light on the leaf folder. The last student would pick up the leaf and then sprint to the finish line.In the game of freeze tag, the students were split up into either predators or prey. The predators would have to catch their assigned prey. They really seemed to enjoy this and most of the kids knew what a predator and a prey were. Our three types of predators included bears, eagles, and snakes. Our prey included mice, rabbits, and chipmunks. This week we all got together and put bird seed on bagels with peanut butter. After all of the students had made about 3 “bird feeders” we took them outside and placed them strategically on branches. These feeders will be used to supplement our bird habitat. We are also planning on hanging bluebird boxes in a couple of weeks. We arrived with 3 different activities for the rainy day and ended up shariing all of them with the students. We began the activities by showing the children 10 different objects for a brief period before putting them away, out of sight of the children. We then asked them to write down what they had seen. The winner(s) were awarded with viles of gems. The next activity was a sort of “pin the leaf on the angiosperm (flowering plant)”. We brought 2 paper cut outs of leaves, 1 paper cut out of a stem, and 1 paper cut out of a flower. We previously pasted small pieces of velcro to each cut out and the wall hanging, blind folded the children (not all at once – but one at a time), and had them try to match the cut outs on to a large flower drawing which she taped to the wall. The kids seemed to really enjoy this activity and some asked to try it a second time. Finally, we prepared a “pollination” demonstration. We cut out flower figures from material, each a different color. We then sprinkled a corresponding color of glitter on each flower positioned separately on a table. We even created our own “bees” complete with fuzzy legs and bodies, which mimicked the body of a real bee. The children “flew” their individual bees from flower to flower and soon saw for themselves the natural distribution of pollen. How do you put together an angiosperm? The students made caterpillars out of molding clay this week. They used different colors and designs to mimic specific caterpillars. They then hung the caterpillars in different locations. In the coming weeks, the students will gather the caterpillars and count the peck marks left from birds. This may help us understand which color caterpillars local birds prefer. We showed up early to hide rocks/gems outside. We scattered them across the back of the natural area then took the students down to find them. As they found the rocks, we were able to identify each rock for the children. They seemed to be really interested in the types of rocks they had collected. The activity soon turned into a competition. This week, the students identified types of clouds, trees, and insects. We also collected pine cones. We will eventually cover these cones with peanut butter, roll them in bird seed, and let the students hang them outside for the birds to enjoy. These feeders will be used in conjunction with bird houses to enhance the outdoor nature lab. Today was our first day of the semester leading activities. 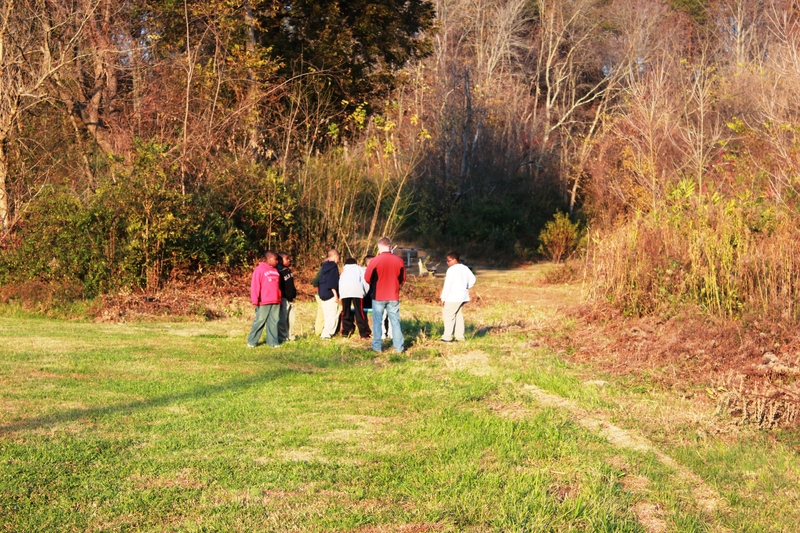 We introduced ourselves to the students, and then led them to the nature trail area on their campus. We had several groups of skulls and animal tracks, and the younger students were required to match up pictures of animals with their respective skull or track. We guided them in this activity.